Can you imagine some 20,000 people getting together to just throw tomatoes at each other? That’s exactly what happened in the town of Bunol in Spain on August 30. La Tomatina is a tomato fight festival that is held on the last Wednesday of August each year. It is probably the world’s largest food fight. 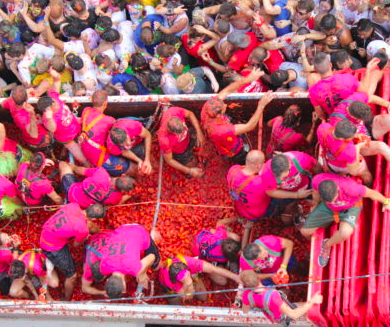 This year, over 150 tons of tomatoes were thrown within the one hour that the fight lasted. The city of Bunol has been hosting the festival for over 60 years. In the 1940s, some people got into a fight and hurled tomatoes at each other. This caught on, and became an annual tradition. However, after the first few years of the tomato fights, the city actually banned them. People who still threw tomatoes were put in jail. In 1957, the citizens of Bunol held “the tomato funeral” – they marched through town carrying a coffin with a single tomato inside. The city finally agreed to allow the fights, and later even started providing the tomatoes for the fights. 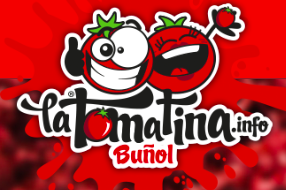 You can watch a video showing clips of La Tomatina here.